The sun had his hat on today and it has been beautiful! 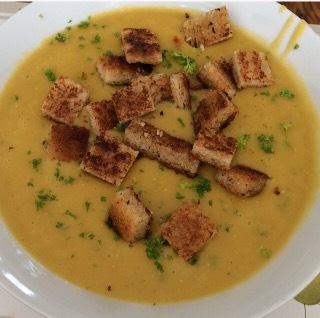 Didn’t fancy much for dinner so made this easy, yummy soup. I hope it’s been good for this Monday?! Fry off the onions and carrots in butter, until the onions become translucent. Add stock, bring up to a simmer. Meanwhile, rince lentils to remove excess starch. Add lentils to simmering stock, and leave to simmer for 30 minutes. Check regularly, to ensure there is enough liquid. If there is not, add more water. Once you are happy the lentils are cooked (this should easily be within the 30 minutes, no more than 45). Chop up a handful of parsley and to saucepan of ingredients. Remove from heat after a couple of minutes, and allow to cool slightly. Blend with a hand blender, until smooth. Be sure to taste at this point. It will more times than not, need salt. Serve with homemade croutons or a dollop of Creme fraiche.